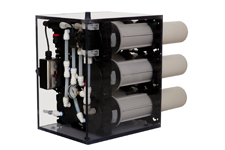 Membrane technology is an effective process to filter water; it uses no chemicals and is energy efficient. Existing water pressure forces the water through the membranes leaving behind bacteria, virus, turbidity, and other contaminants. We have systems that can be used to treat the whole home or just one faucet depending on your needs.